I went to the start-up celebration for the implementation of the Medical First Responder Program for the Station 42 Protection District. Up to this point the fire department only was available for medical calls associated with responses to traffic accidents within the fire protection district. As of April 1st home medical responses will be added to the fire department mandate. This means when a 911 call is made for medical purposes and an ambulance is dispatched the fire department will now be dispatched at the same time to the residential address. Due to the longer response time for the ambulance residents and guest in the area will now see the fire department first who will stabilize the patient and await the ambulance arrival. In a medical call, where seconds can mean the difference between a successful outcome or not, and the ambulance has a lengthy response time and distance the fire department response truly is a life saving service. As someone who did medical responses for years I have first hand knowledge of the value this service offers to the residents and people within the service area. 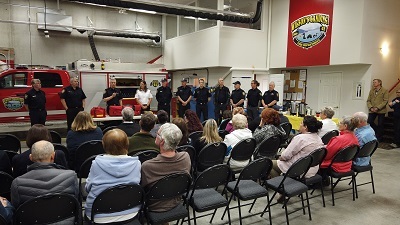 Good luck and best wishes to the dedicated firefighters that make this program possible in the more rural areas of the Central Okanagan Regional District, you are truly making a difference.